Order of Operations Set 6 [with Brackets], Fractions, and Decimals - Order Up! Welcome to a great resource that will allow your students to practice KEY skills in a self-checking, self-paced way. Check out the FREE PREVIEW to see what is included! This set of ORDER UP! focuses on Order of Operations Set 6 [with Brackets], Fractions, and Decimals. Please note that this set does NOT include exponents! 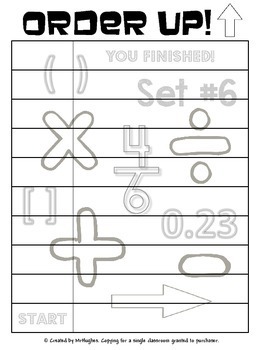 **We DO offer easier sets to get kids started with Order of Operations. **WAIT! This set of Order Up! is part of the Order Up! 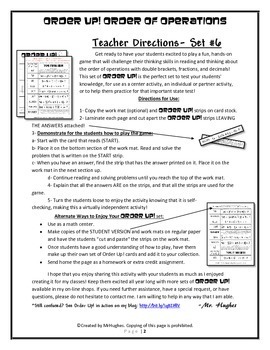 Order of Operations Bundle! You may want to buy the bundle and $ave! Loving Order Up!? Check out these other MATH BUNDLES and SAVE! 10 Sets for the Price of 8! © Created by MrHughes. Use for a single classroom and/or teacher. Additional copies must be purchased if you plan to share with other teachers. No part of this resource maybe posted on a blog (personal or commercial), webpage/site, server, or other location that is accessible by multiple people without express written permission from the copyright owner. Violations of this notice are subject to the penalties of the Digital Millennium Copyright Act (DMCA).